For those in the West, the biggest subscription video-on-demand (SVOD) services in the Asia Pacific region may be unfamiliar names but they're seeing huge growth. According to Digital TV Research, the region will count 351 million SVOD accounts by 2023. That year the biggest player will be Tencent with 82 million accounts, followed by iQiyi with 80 million and Youku Tudou with 33 million. The biggest SVODs in the West are not expected to ever be standalone services in China, Digital TV Research says, due to foreign ownership rules. It projects Netflix will take fourth place with 24 million Asia Pacific subscriptions by 2013, followed by Amazon Prime Video with 17 million. While the region had 141 million SVOD subscribers in 2017, that will swell to 351 million in 2023. Thanks to its higher price, Netflix will reap the most revenues with $3.12 billion in 2023. 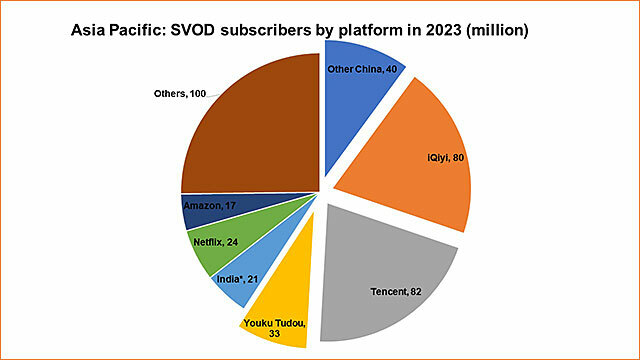 Total SVOD revenues for Asia Pacific were a little under $5 billion in 2017, but that should grow to $15 billion in 2013. "Asia Pacific OTT revenues from TV episodes and movies will reach $42 billion in 2023; nearly triple the $15 billion recorded in 2017," notes Simon Murray, Digital TV Research's principal analyst. "The total will increase by $5 billion in 2018 alone.” Advertising will be the biggest revenue-generator for OTT sites.